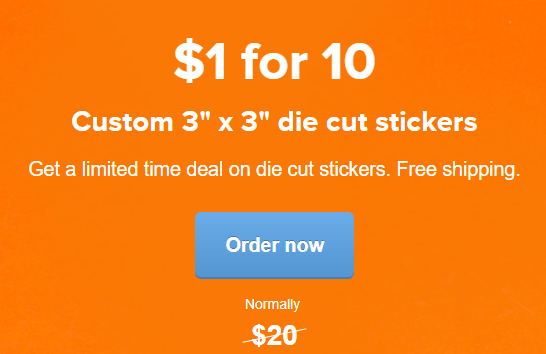 10 Die Cut Stickers from Sticker Mule for only $1 – Regularly $20! Vinyl stickers are the bomb. And nobody does them better than Sticker Mule. Okay, this deal is really for all our entrepreneurial homies out there (people don’t say homies anymore do they?). Get 10 3″x 3″ die-cut vinyl stickers from Sticker Mule for only $1 – that’s more than a 90% savings when these stickers would regularly cost $20. How it works. Upload your custom graphic. Sticker Mule will print it and cut it so that its just your logo. On a sticker. Discount applied at checkout. Get your free stickers here and then tell us – what does your logo look like?